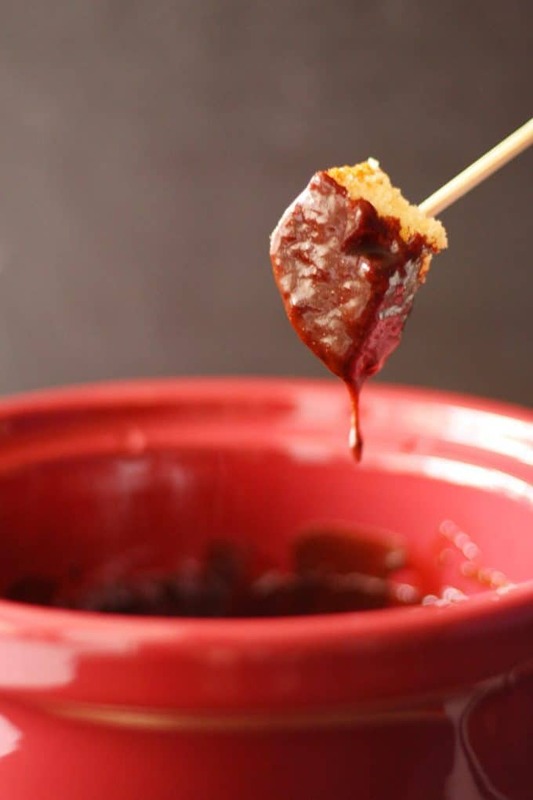 This slow cooker chocolate fondue recipe is perfect for a romantic night or a Valentine’s Day celebration. 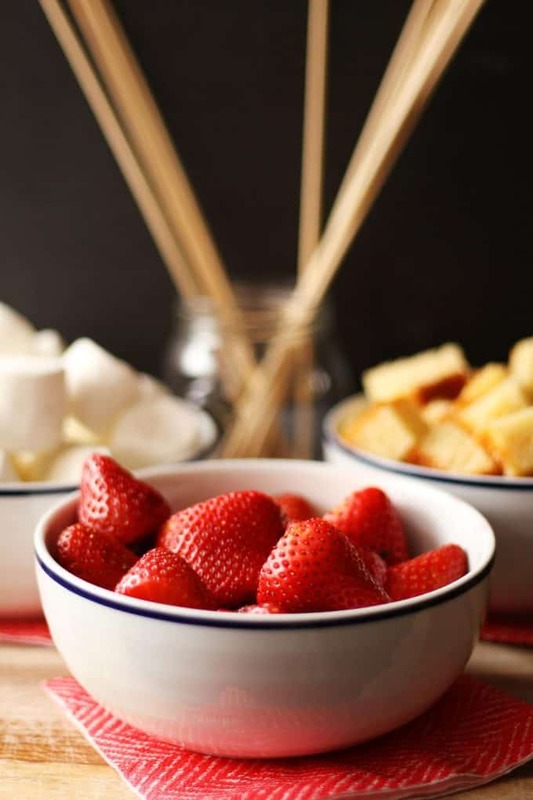 Get your marshmallows, strawberries and banana slices ready for dipping. 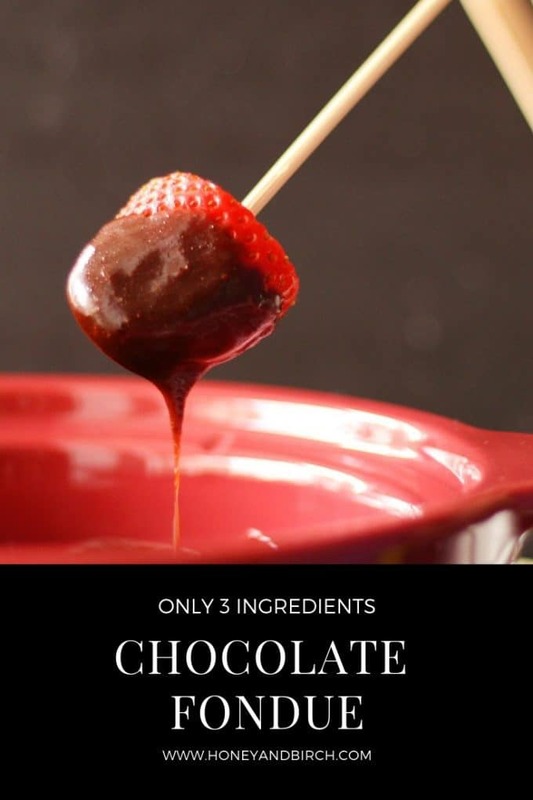 This 3 ingredient dessert recipe is delicious! 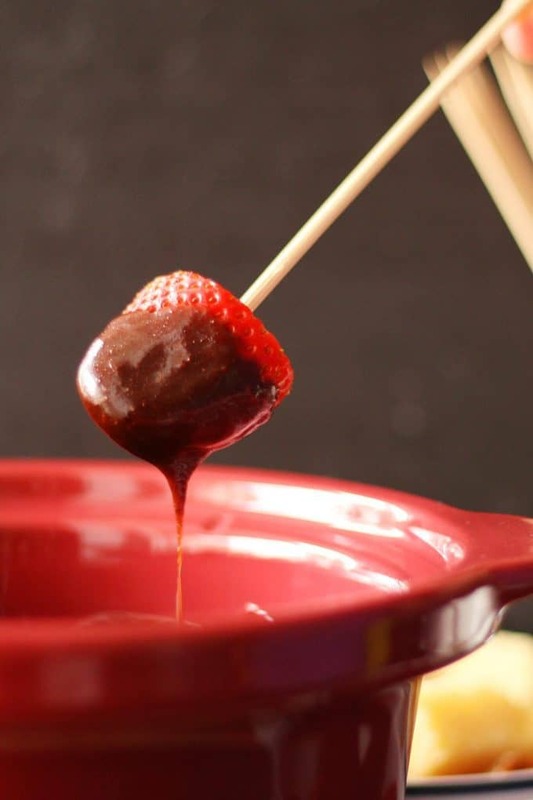 If you’re looking for a fun way to celebrate Valentine’s Day, or any day for that matter, chocolate fondue is your answer. The first time I had chocolate fondue was a glorious moment. All that chocolate-y goodness – I definitely had a sugar high that day. 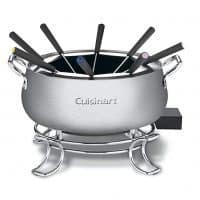 I was at a popular fondue restaurant and it was years before I started this website. Even then, I was trying to figure out ways to have fondue at home. It has brought me many savory delights over the years. Slow cooker sweet and spicy meatballs – the easiest appetizer ever. Slow cooker mango pulled pork sandwiches – great for dinner or lunch. And slow cooker chicken tacos – whether it’s in a lettuce wrap or in a bowl, you can’t go wrong. I obviously love my slow cooker. 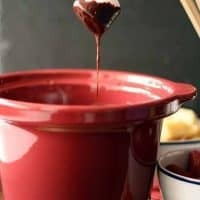 The great thing about fondue in a slow cooker is you don’t need a fondue pot. 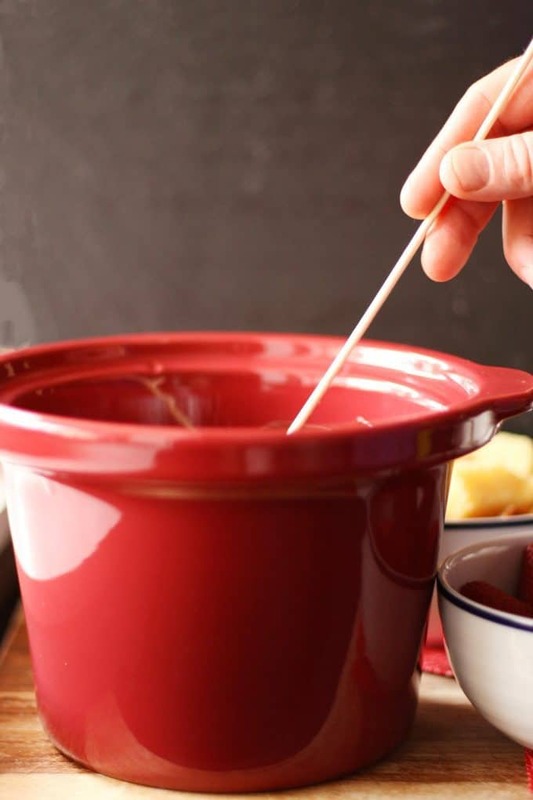 You can use a fondue pot if you have it, but if you don’t, a small crock pot and some wooden skewers is all you need. 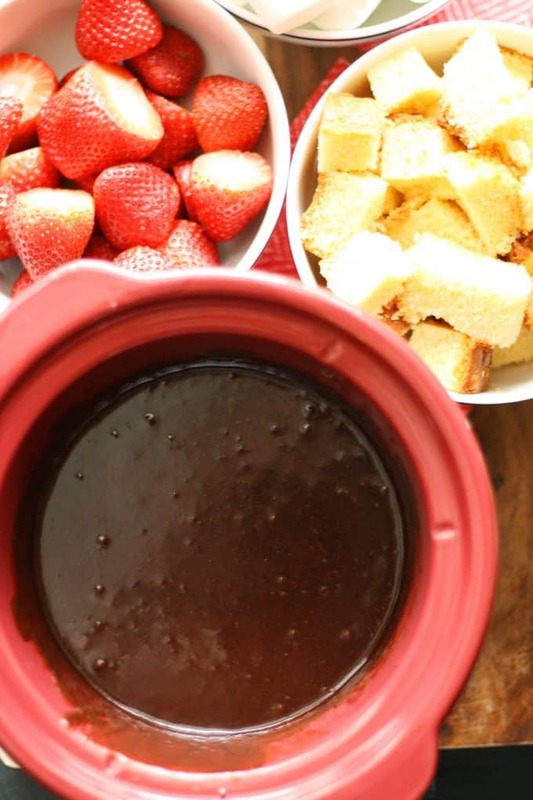 My slow cooker chocolate fondue recipe uses only 3 ingredients. You can easily buy them ahead of time and keep the ingredients in your pantry. One of the ingredients is a jar of seedless raspberry jam. Not a fan? Substitute your favorite jam flavor! 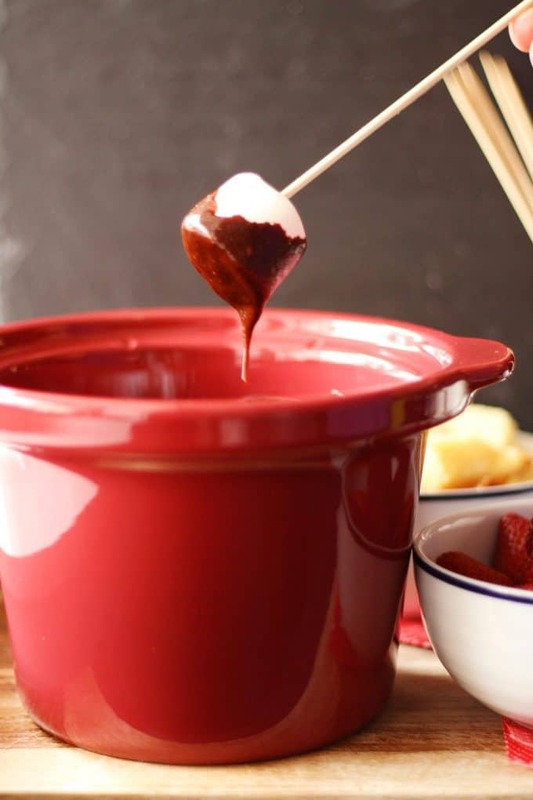 This recipe is definitely chocolate fondue for a crowd. If you have leftovers, transfer them to a container (or a mason jar!) and store in the fridge for 5-7 days. You will need a mini slow cooker or a fondue pot to start. 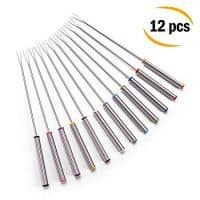 To dip into the chocolate, I usually use long wooden skewers – they are cheap and I always have them in a drawer. If you plan to make this often, consider investing in some fondue forks. You can make one small change to this recipe and have a myriad of recipes. Switch out the chocolate chips! You can use dark chocolate chips, white chocolate chips, peanut butter chips, or mint chocolate chips. Try out all of the different varieties to suit your flavor tastes. 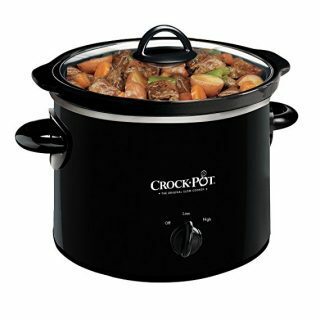 Combine all ingredients in a 2 1/2 quart slow cooker. Cook on low, stirring frequently to combine the ingredients. Once all ingredients are well mixed and hot, approximately 1 1/2 hours, serve. Thanks for the fondue recipe! I am soooo totally considering this! Mmmmmmmm! THANKS! This looks SO GOOD, and is a great idea for a nice romantic, low-key way to spend Valentine’s Day together. Hi Nadine, the three ingredients are in the recipe in the blog post. What a great idea for Valentine’s Day! Delicious!! OH.MY.STARS! I melted just reading the ingredient list. LOVE this! So glad you shared with us at Weekend Potluck. Keep em coming – please! So easy! Thanks for sharing on the What’s for Dinner link up and don’t forget to leave a comment at the party – Next week’s features that also leave a comment get pinned and tweeted! This chocoholic’s mouth is watering! I so wish I could just reach through the screen and have me some of that!